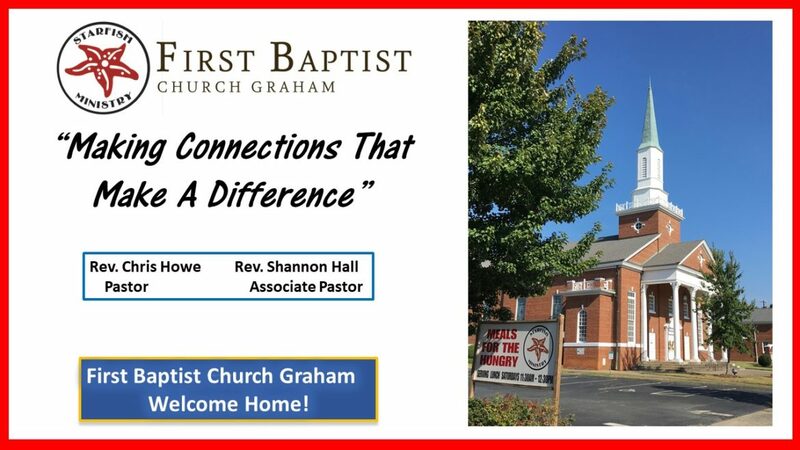 Welcome to First Baptist Church of Graham (FBCG), a moderate Baptist church, conveniently located at 224 N. Main Street in Graham, NC. We are affiliated with the NC Cooperative Baptist Fellowship – CBFNC.org. (national) and the Cooperative Baptist Fellowship of NC. FBCG is also a part of the Mt. Zion Association. Here at First Baptist Graham, we worship in a style that we like to call Classic Worship. We sing all the traditional hymns with the pipe organ, as well as some of the more contemporary hymns and choruses composed in the last couple of decades. Our Chancel Choir sings mostly contemporary anthems accompanied by the organ or piano. Our staff and our laypeople share in leading parts of each service. We welcome you to come dressed however you chose, either dresses and coats and ties, or polo shirts, khakis or jeans. We have a great staff, headed up by our Pastor, Rev. Chris Howe. You will additionally see posts about our church on Facebook, as items of interests and events are also posted on FB as well. If you want to look at several of our Sunday Bulletins, click here. We also have a mid-week Prayer Service/Bible Study on Wednesday nights starting at 6:30pm. We would love to have you visit us and become a part of our church family.